This is a great solution to prevent doors from opening into walls or other cabinets, if the cause is the door swinging too wide. Ideal for corner cabinets, adjacent cabinets whose doors open against one another, or any other cabinet where obstacles near the door would be damaged by the knob during opening. Simply clip it on and put an end to your worries about damaging your cabinet doors. 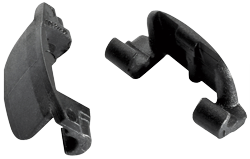 Restrictor clip limits opening angle of door to 86 degrees.